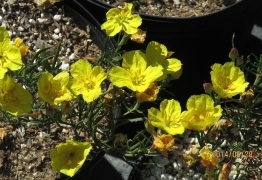 Calylphus berlandieri- Berlandier’s sundrops- is a southwest native growing in Texas, Oklahoma, New Mexico, and northern Mexico. Small size H 8″ x W 2′ and it’s bright yellow flowers are just about every blooming. Excellent meadow gardens or perennial borders.